« New Movie News! A Bucket of Blood, Ninjas VS Monsters, Gutterballs 2, and The Frame! Blair Witch Project Documentary and a Happy Birthday to Don Dohler! Gene Crowell has been involved with independent films for a couple of decades now. In 1999, he and a few friends made a documentary about the locations used in the BLAIR WITCH PROJECT. Here’s what he told me in his own words: “Our video was shot in 1999 and features the only in camera interview with the then mayor of Burkittsville and a full top to bottom tour of the Rustin Parr house! Which was demolished years ago. The films production designer Ben Rock said we had the best house footage he’s ever seen!” Let’s face it – that’s pretty super awesome. Why not go to YouTube and “Thumbs Up” this video? Super rare – super cool! 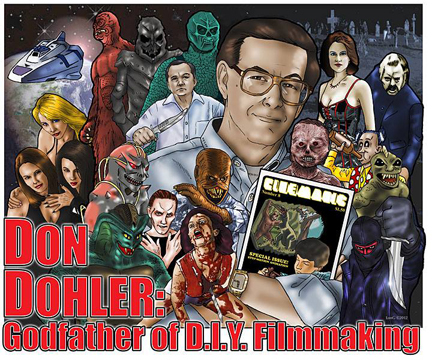 January 27th is a day we at Smash or Trash always celebrate; it’s D.I.Y filmmaker Don Dohler‘s birthday! This site is dedicated to Don’s memory, and all the people he influenced whom are now in the movie biz. This day, why not pop one of Don’s movies into your DVD player and give it a spin? Or, go over to Smash or Trash’s CafePress store and pick up some Don Dohler merchandise? Part of the proceeds go towards cancer research! HAPPY BIRTHDAY DON! WE LOVE AND MISS YOU!